For the Fellowship Programme in Management, IIM Indore seeks high quality candidates with strong academic background, preferably with professional experience, and intellectual curiosity needed for scholarship in management. Out of the aforementioned areas, an applicant can choose any one area of specialization only and submit his/her application along with all attachments as mentioned in the on-line Application Form. The proposed intake for Fellow Programme in Management (FPM) 2019 is 30 for the academic year 2019. 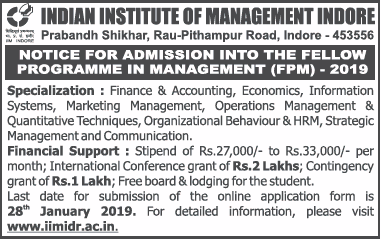 Candidates seeking admissions to the Fellow Programme in Management (FPM) of IIM Indore should submit their application online (click here) during the period Wednesday, October 17, 2018 to Monday, January 28, 2019 and pay the online non‐refundable/non-transferable application fee of Rs. 1000/- (Rupees one thousand only) + GST extra for General and NC-OBC category and Rs. 500/-(Rupees five hundred only) + GST extra for SC, ST and PWD category. * Candidates who have registered for CAT 2018 and indicated their interest for FPM of IIM Indore while doing the registration for CAT 2018 will not be required to pay any application fee as mentioned above, if they apply for FPM 2019 of IIM Indore. Selected candidates shall be required to deposit a commitment fee of Rs.50,000/- (Rupees Fifty Thousand only). This fee has to be paid at the time of acceptance of the offer letter by the selected candidate and is to be made vide an online bank transfer. An amount of Rs.20,000/- out of Rs. 50,000/- (commitment fee) deposited by FPM students shall be retained till completion of the programme and refund shall be considered in the following manner. Refund of Rs.20,000/- after submission of No Dues/ Clearance form. Currently the FPM students at IIM Indore are provided the fellowship grant/stipend of Rs.27,000/-(Rupees twenty seven thousand only) per month during their course work (Term-I, II III and IV) and Rs.33,000/-(Rupees thirty three thousand only) per month after clearing the area comprehensive examination as per norms. A contingency grant of Rs.25,000/-(Rupees twenty five thousand only) per annum for 04 years is also provided to FPM students for supporting the research efforts and is subject to the norms of the programme. The Institute subsidizes for presenting papers in National Conference once in a year from second year onwards. For International Conferences, the Institute subsidizes expenses subject to a ceiling of Rs. Two lakhs with a provision of attending a maximum of two International Conferences plus International Doctoral Colloquium or International Professional Development Workshop during the entire period of the programme but not beyond five years.